This was a fun challenge at The Three Muses this week and the theme is "Up Up and Away". I couldn't help but hear that "5th Dimension" song playing around in my head! 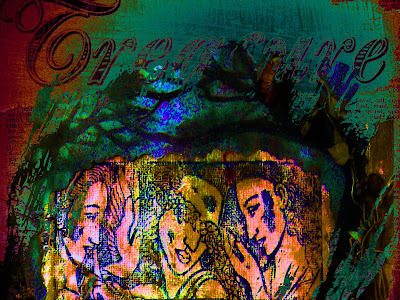 This is a digital collage made up of a scanned background-DCWV decorative paper, a Dover image and a lot of playing around in Photoshop with different gradient hues and layer effects. The balloon is actually a photo I took of a balloon x-mas ornament that I have and erased out the background. 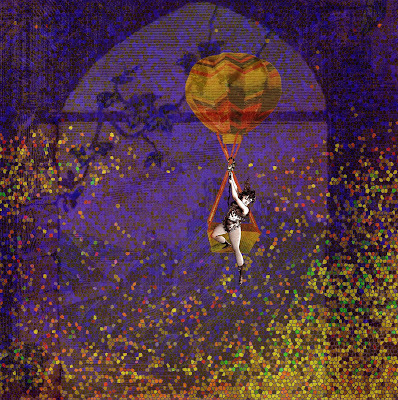 The colorful pixels are sort of an accident- that I liked! Thanks again to The Three Muses for wonderful inspiration! 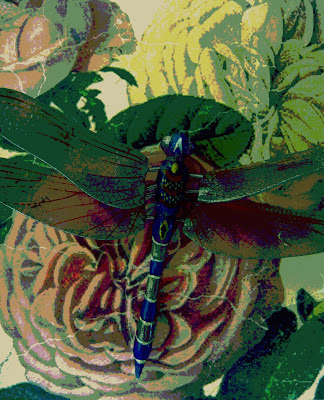 This is my entry for Rosie and Linda's Art Adventure ( A Dazzle of Dragonflys). 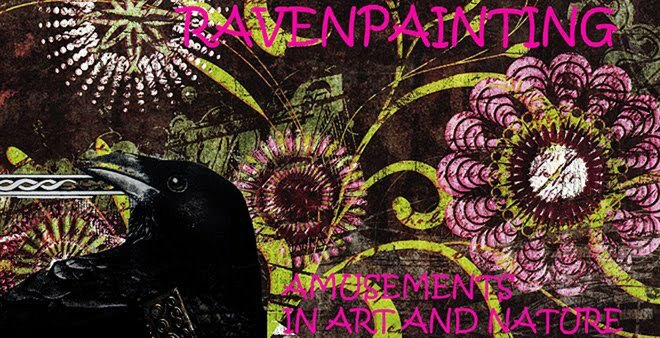 This is a digital collage of mixed elements blended in Photoshop using 4 different layering tools. 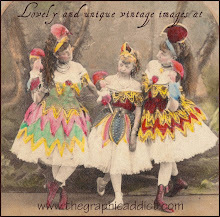 Mixed Media Monday has a theme entitled Playful Dolls this week. This is a paperdoll I assembled with decorative paper (origami and crete paper included). I put the body parts together with heart -shaped brads. I added cut wings and trim embellishments and the face is a Dover image. Silk flowers make up her skirt. She was then added to a journal page that I hand painted and rubber stamped. Alot of color, alot of mixed designs, alot of fun! 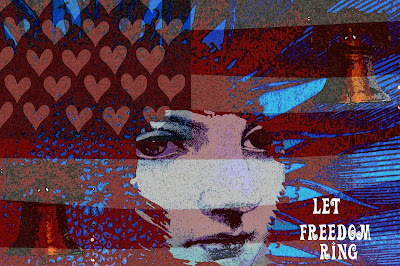 This is my entry for Sunday Postcard Art -the theme " 4th of July". Aside from all of the barbeques, fireworks and summer fun , Independence Day here in the U.S. reminds us all of how precious our freedoms are to us. We try to honor our ability to speak freely, express ourselves and be heard. We honor the right of every citizen to have the same possibilities in life, and we honor the freedom to follow our own beliefs in our own way and to allow our neighbor to do so as well. Happy 4th to all! This is my entry for TGIF theme "Alphabet". This is a page from a unfinished fabric journal (rubber stamping on painted fabric canvas). At the top I used a wonderful celtic braid. The lettering is old English. If I get some time I would really like to finish this journal- I almost forgot about it! 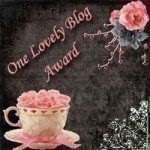 I was surprised this week by being given this lovely blog award by Luisa and Risa. 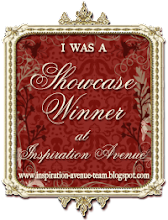 Please take the time to check out their beautiful blogs. Many thanks to both of them for their kindness! This is my tag entry for the Tag it On Challenge- Eternal Goddess. Frida Kahlo has always been a great source of inspiration for me artistically. 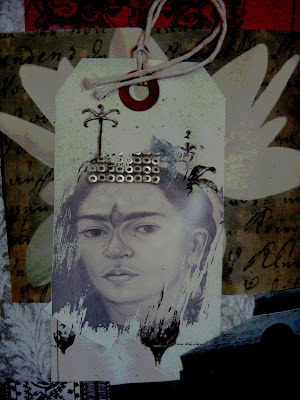 I made this tag and composed it with a collaged background of mixed images. This is my entry for The Three Muses Challenge "Wild Things". The image is from Dover and I added a photo of some dried ocean coral and some ferns from my yard to create a forest veil/jungle look. I also scanned in some fun faux leopard fur for a background. This is a journal page spread I made pertaining to storytelling. The pages are handpainted with mixed elements (rubber stamping, fabric, and ephemera). This is my entry for Mixed Media Monday " Tell Me A Story". 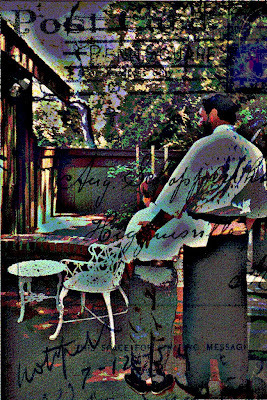 This is a digital postcard I made from a photo I took of my son and his Dad (taken 22 years ago) in our yard in Mill Valley, CA. I always loved this photo and to me it represents "Dad" in all of its best definitions. 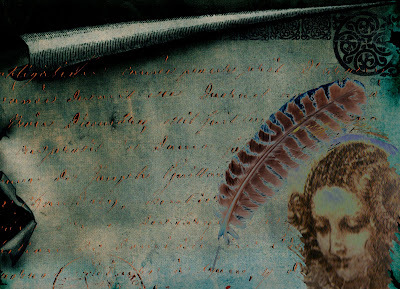 I used an actual old post card as the background layer and then blended the photo in Photoshop , adding artistic filters. My own Dad left when I was very young. I saw him once when I was 25 (and pregnant) and have not seen or heard from him since- that was 29 years ago. So, needless to say I don't have much to go on when it comes to my own relationship with a father. But my husband (we've been married for 35 years this July!) represents the best a Dad can be; kind, encouraging, supportive, and patient . I'm not a grandmother yet but someday if our son does have kids and his own sense of what a "Dad" should be kicks in, he's been given the best example possible by his own Dad. This is my entry for the Sunday Postcard Art Challenge. Doorways for me have always been challenging and " Unhinged " represents that brief moment when one goes through a door way and that moment of uncertainty takes place. One never knows whether walking through a door will bring wanted or unwanted change- but change will occur. 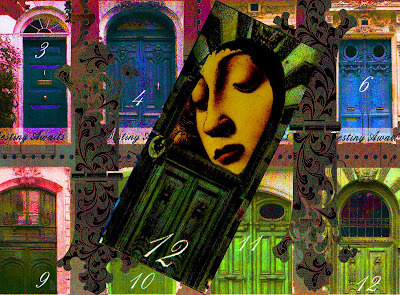 I made this digital collage using a faux postage sheet from Artchix(background) and I cropped a door and face image and added a doorknob from three different sources. I also cropped and erased hinge hardware images and added them. Linear light and posterized applications were added. This is my entry for the Crazy Amigo Challenge "Do You Believe in Fairy Tales". 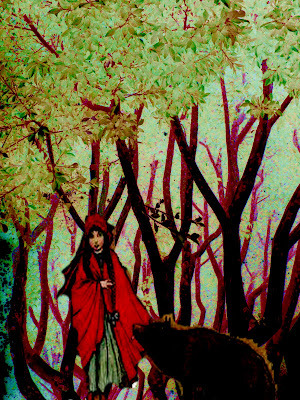 It is a digital collage I made using an image of Little Red Riding Hood (from The Vintage Moth) and a photo I took of some very mysterious trees in San Francisco recently. I erased out the background and added digital highlights to give it an eerie look. We all loved fairy tales as children but it is interesting to read the stories again as adults and discover the hidden, more "mature" meanings behind them. On of my favorite books is "Women Who Run With The Wolves" by Clarissa Pinkola Estes, which deals with the mythology and symbolism behind fairy tales. 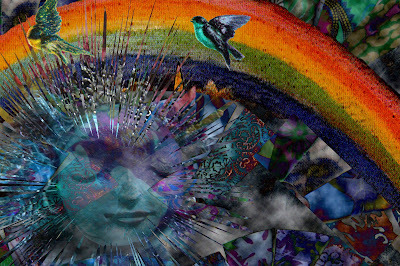 The theme for this weeks Sunday Postcard Art is "Over the Rainbow". I made this postcard out of a batik collage that I made and imported a photo of a doll face that I made out of fimo clay and a sculpey mold. I used the cookie cutter tool in Photoshop for the cropped shape. The rainbow I scanned and imported from some printed fabric. I wanted to give this piece a dreamy , magical feel as the theme implies. 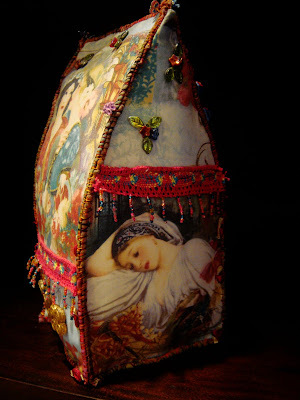 This is a fabric house I made using beautiful collage fabric from Ben Franklin Crafts and assorted embellishments. I cut out the shape of a house in extra-heavy duty interfacing, the decorative fabric and a matching plain fabric (for the back or inside pieces). I then rolled the cut edges tightly (outward) and hand sewed with a whip stitch all around the frame of the house. I then simply sewed the house frames (plus a bottom) together. The thick interfacing gives the house its support. Embellishments (lace trim, beads and jewelry were then added last. A fun but time-consuming project- good for cold winter days! This is for Saturdays Workout (Fabric Art). Ah yes , the inner child...When I was a child there was nothing that brought me more comfort than a box of crayons and a coloring book . 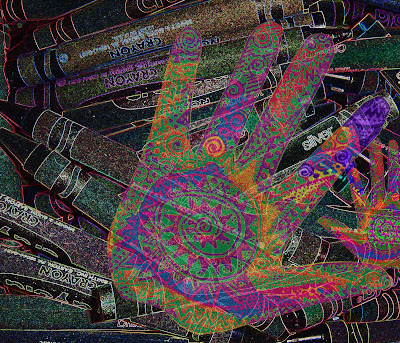 I also remember drawing lots of hands - my hands -tracing them, turning them into turkeys at Thanksgiving, coloring them too with every color imaginable. 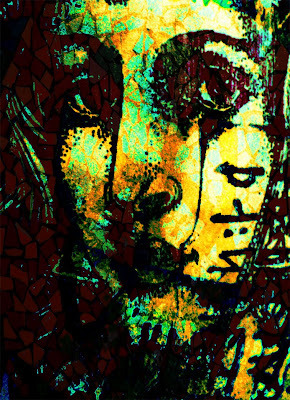 I still like to color but with sometimes a little more sophisticated tools- hence this digital collage. That inner need to create is still there -I think we all have it- or we wouldn't blog or create every chance we get. The trick is to keep the "child" like attitude about our creativity and not overthink what we make so much- just let it happen! 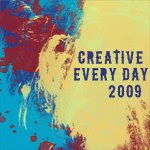 This is my entry for Inspiremethursday's theme Child Art (great idea Sarah)!. This is my entry for "Fashion" at Wednesday Stamper. This is a snippet of a journal page entitled Slave to Fashion (which I'm not) but it is a huge industry and we are all influenced by it whether we like it or not! 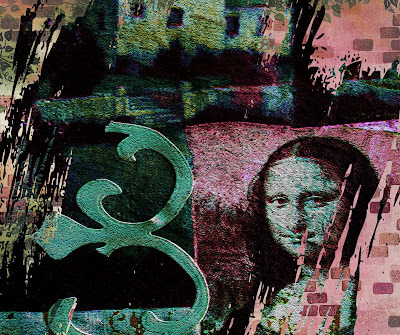 This is a section of one of my journal pages that I altered for a new challenge group that just started- The Three Muses and the theme is "Mona Lisa". I wanted to digitally alter this page to give it a torn, weathered, grafitti look. I layered it onto a brick wall design and added a cracqueliere effect. Fun new challenge- fun theme! This is my entry for TMTA "Magical". 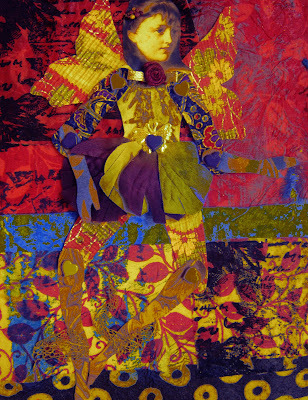 A digital collage using Lunagirl images , hand colored and torn paper. 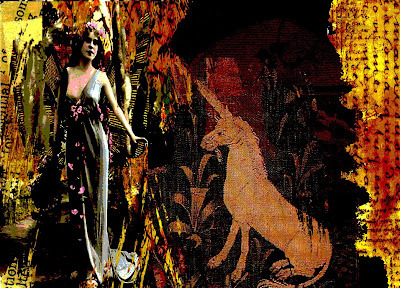 A sort of modernized version of the lady and the unicorn. Wouldn't we all love to see a magical unicorn while strolling through the woods- I keep looking! This postcard was fun to make - I wish it were warm enough to go the beach! I love the coy attitudes of Vintage Bathing Beauties the theme for SPA this week. Those were simpler times! 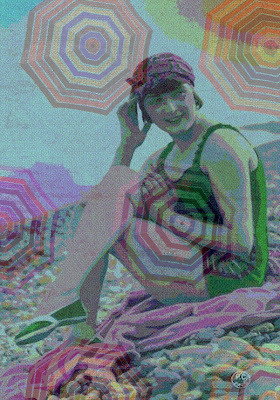 This is a digital collage made from a Lunagirl vintage image and beach parasol decorative papers. Layers enhanced by soft light and posterized modes. 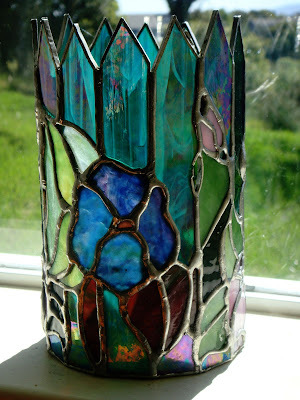 This is a stained glass candle holder I made using a 6" black plumbing pipe with a pattern attached to it. I worked in the round cutting, grinding and affixing the pieces with tape as I went. All pieces were copper foiled, fluxed and then soldered together on the outside first. I then removed the black pipe and pattern and soldered further on the inside. I cut a 6" circular piece of glass for the bottom and foiled and soldered that on last. I use a pillar candle inside to illuminate at night or put in a window during the day and enjoy the light that comes through. This is my entry for Saturday's Workout (Soldered Art). This week's theme for Inpire me Thursday is the lost art of letter writing. This is a subject I often think about in these day of emails, faxes, text messaging, cell phones and yes, blogging! (which are all great) but it is a lost art to actually sit down and write a meaningful letter to someone. It used to be one of the only ways to express feelings and important news to each other. Everything is so available to us now (instant) and out of breath communication is the norm. Small bytes of info coming in and out- are we really getting through to each other? It is interesting thinking about how people took (or seemed to have) more time to really compose their thoughts and focus on the intended receiver. I still handwrite thank you notes (yikes- no backspace or delete buttons for misspelled words) and letters to my mother (she's not computer saavy yet) and I am trying to approach my blogging with the same sense of meaningful composition as I would in a handwritten letter. Yes, after creating my digital collage above and writing this post, a couple of hours have gone by- but I feel like in the time I spent (letting everything else go) I have accomplished something - and that makes the time worthwhile! 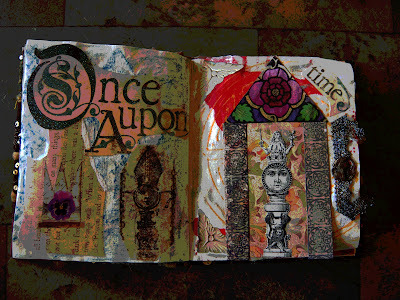 This journal page is for Wednesday Stamper with the theme of faeries. 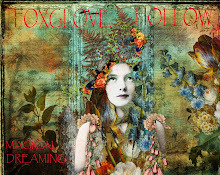 I used a number of mixed images along with a rubber stamp image. There are about 4-5 digital layers involved to the get the desired effect. 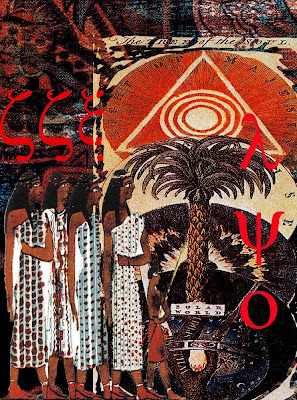 The theme of "Egypt" is so rich in color and image I had to make an ATC for TMTA. I should be working but I got carried away with such fun! 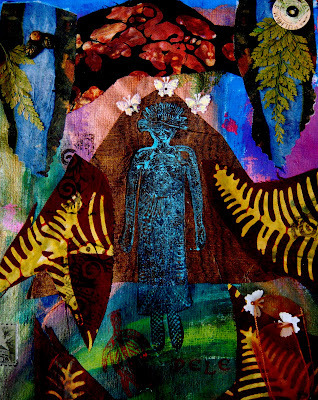 This is a mixed media journal page entitled "Pele" as a collage representation of the Hawaiian goddess. 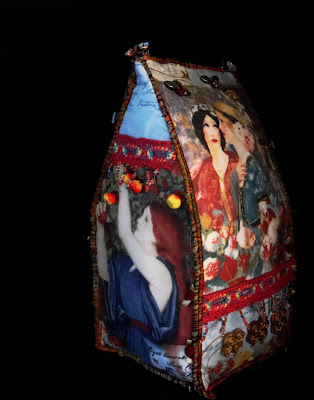 It is made up of multi layers of paint, tissue paper, fabric, ribbon and trims. 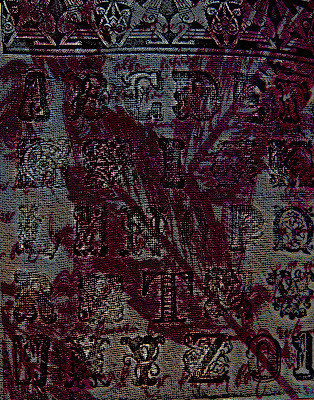 The rubber stamped images are from "Impress Me" stamps. 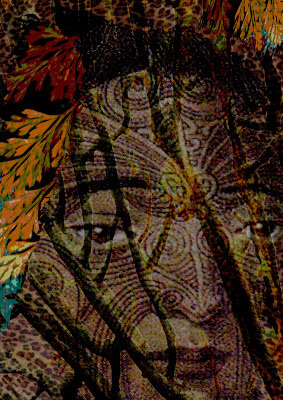 "Layers" the theme for Mixed Media Monday is a huge part of composing any visual art piece (journal pages, digital work, cards, scrapbooking etc.) which all entail layering- many of which don't show and serve as foundational layers. The thing that I have discovered (particularly with digital work) is that when composing a piece you immediatley know the point when there are too many layers or not enough layers altering the piece significantly. The trick is recognizing that perfect point when the piece says "I'm done".